There was a protest on thursday against the blacklisting of workers and some fear the practice may still be going on. ‘The workers of the world have nothing to lose but their chains,’ was how Karl Marx once put it; and this famous phrase applies to blacklisted workers perhaps more than any others. 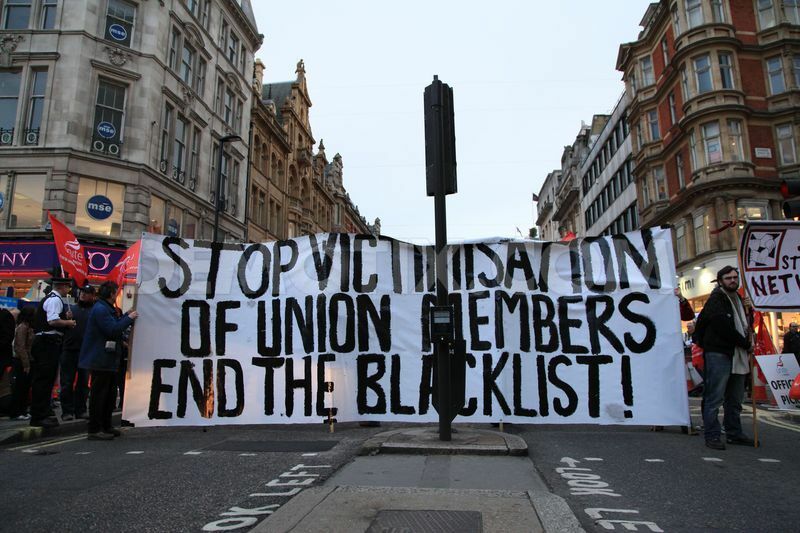 On Thursday evening blacklisted workers stopped traffic in the Oxford Circus area of London for nearly 2 hours, keeping the scourge of blacklisting in the public eye while maintaining pressure on the authorities to open a public inquiry into the scandal. Campaigners are adamant that the practice is continuing to this day, and that further evidence is about to be released which proves high profile construction companies are still denying skilled workers jobs simply for raising health and safety concerns. Blacklisting in the construction industry during the 90’s is currently the subject of a parliamentary select committee inquiry, and the practice has been roundly condemned by Labour MP’s. Although welcoming MP’s recent comments, Blacklist Support Group spokesman Dave Smith insisted fine words were ‘not enough‘. Mr Smith – himself a blacklisted worker – was adamant that the practice is still occurring on building sites up and down the country. “We have evidence that…[when] someone becomes a safety rep, not only do they get sacked, they can’t get a job anywhere else,” he said. Huge banners stating ‘Blacklisting Ruins Lives’ were used to barricade the road on Thursday evening, as police stood by helpless and unable to move the demonstration from the road. Campaigners could be also heard venting their anger at Crossrail site managers, shouting ‘sinister’ and ‘scum’, repeatedly. “Crossrail Limited is not aware of, and has seen no evidence of, blacklisting of any kind in connection with the Crossrail project. If Unite has any evidence then we wish to see it; we have made this point a number of times and yet none has been forthcoming,” he said. If it wasn’t worrying enough that blacklisting might be continuing, widespread suspicion among construction workers of collusion by state agents in the gathering of sensitive political and personal information for their blacklist files (unearthed in 2011) was given extra traction this week. Ex-Economic League (an extreme right-wing group which kept files on more than 22,000 blacklisted ‘subversives’ before it was wound up in 1994) member of staff Jack Winder gave evidence to the Scottish Affairs Select Committee investigation into blacklisting and admitted having contacts and holding regular meetings with Metropolitan Police, West Midlands and Scottish Special Branch at least up to 1994. Many meetings took place in a pub next to Scotland Yard, he claimed. This was in addition to the late Ian Kerr’s admission in December that his consulting association Blacklist regularly consulted police about ‘bad eggs’ in the industry. Whether blacklisting is taking place today (and it should be noted, the technology and mindset exists amongst some construction bosses to make it happen) the consequences are still being felt. Take construction worker ‘Stephen’ – not his real name – who was on Thursday’s protest. He suffers from a serious heart condition, which can’t be proven to have been solely down to blacklisting. But 8 years of working in the ‘black economy’ and living on the breadline has certainly not helped. He has days when he can stand for an hour or so, as he was yesterday. There are days when his heartbeat is so unpredictable he can’t sit up in bed. Now he is receipt of disability benefit has to meet Atos next week – a prospect that fills him with dread. The campaign for compensation, justice and an end to this appalling practice is not about to stop anytime soon. The implementation of safety measures is very important. The blacklisted workers are not allowed to work because of their safety issues. They should take it in positive way.